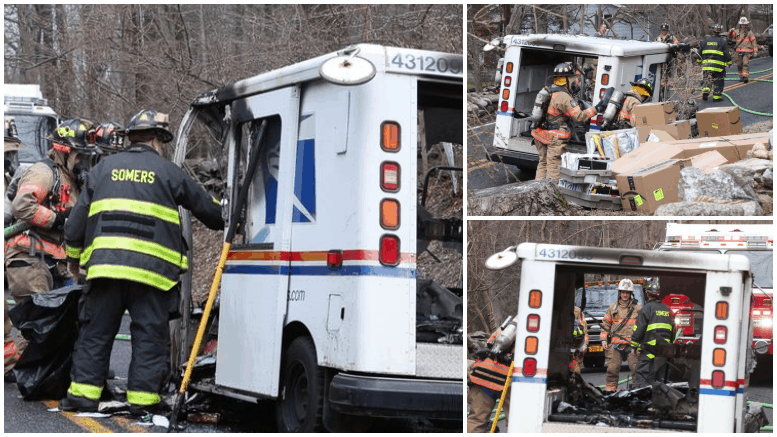 SOMERS – An engine fire today damaged a mail truck and some of the mail it was carrying. The carrier was uninjured and able to salvage some of the items from the back of the truckbefore it was consumed in flames around 2 p.m. near Warren Street, but other items were destroyed. Somers firefighters, with help from Mahopac, had the fire under control in about 15 minutes. State police responded, as well as the Somers postmaster. Warren Avenue was closed in both directions in the area of the fire. Be the first to comment on "Engine fire destroys mail truck, burns some mail in Somers, NY"